In an effort to provide full disclosure this is the equipment I typically carry when hiking. A Manfrotto 055CXPro03 tripod with a Markins Q20 ballhead attached. I normally carry two cameras, a Nikon D300s and a Nikon D80s. One serves as a primary camera, with the lens that I think will be using most frequently on the hike, and a backup camera also with another lens attached. The two lenses that I will have mounted on the cameras will vary depending upon what I will be photographing. I commonly carry a Tamron 28-300 mm, Tamron 200-500 mm, Tamron 11-18 mm and a Sigma 150 mm macro lens. I also use a F-stop Tilopa BC camera pack. I engage in a wide range of photography including landscape, avian, macro, wildlife etc so it is rare that I can’t find something along the trail to photograph. It is also important to note that I am one of those lazy photographers that can think of all kinds of reasons for not taking my camera out of the pack. Usually it is something on the order of I’ll catch that photo on the way back or I’ll probably see something better later . As a result I rarely carry my primary camera in my pack. I’ve missed too many shots because I found a flower or some animal jumped out or a bird flew to a nice perch along the trail . 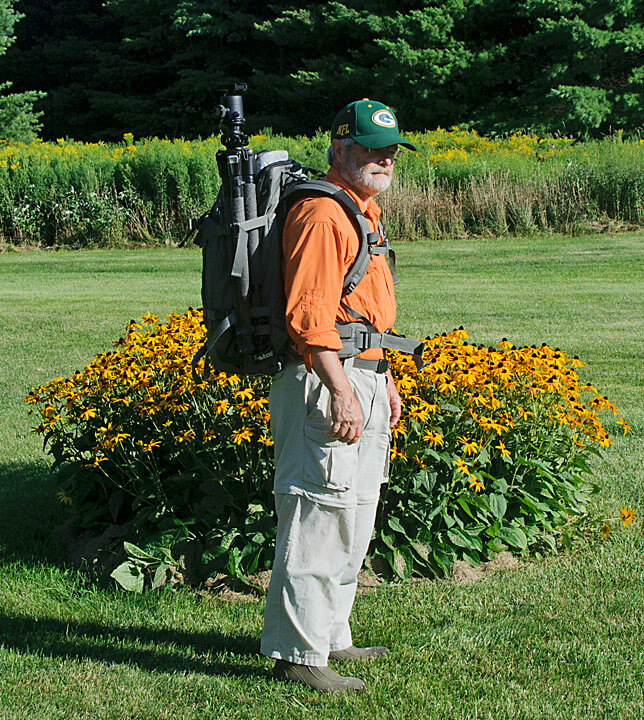 Normally I carry my primary camera and lens mounted on the tripod. This does mean that the camera needs to be secularly attached to the head. You also need to watch so the camera strap doesn’t drag or catch on something. When the camera is on your shoulder you need to be aware of low limbs so you don’t hit your camera or lens on a branch. If I’m going to be photographing something that is several miles away and I know I will not be doing any photography on the way to the site I will put the camera in the pack and attach the tripod to the outside of the pack. This rarely happens because of the range of photography that I do. 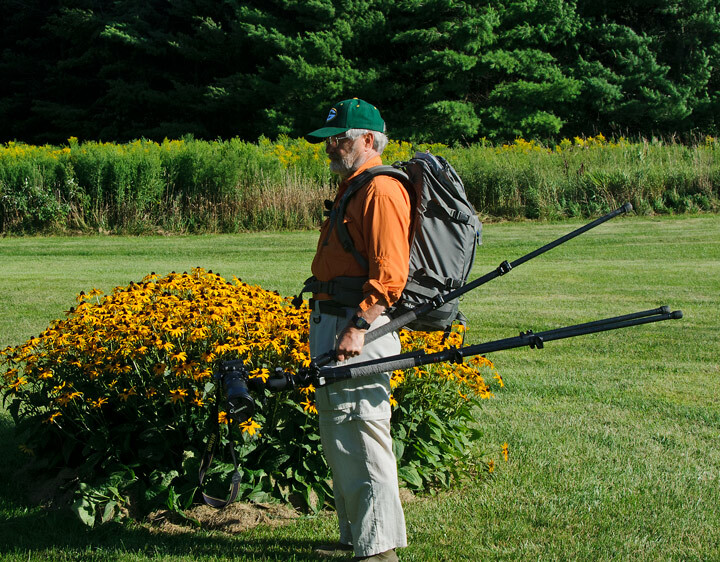 The f-stop Backcountry pack allows the tripod to be attached to either side or the back of the pack. I can probably count on one hand the number of times I’ve carried the tripod strapped to the pack. 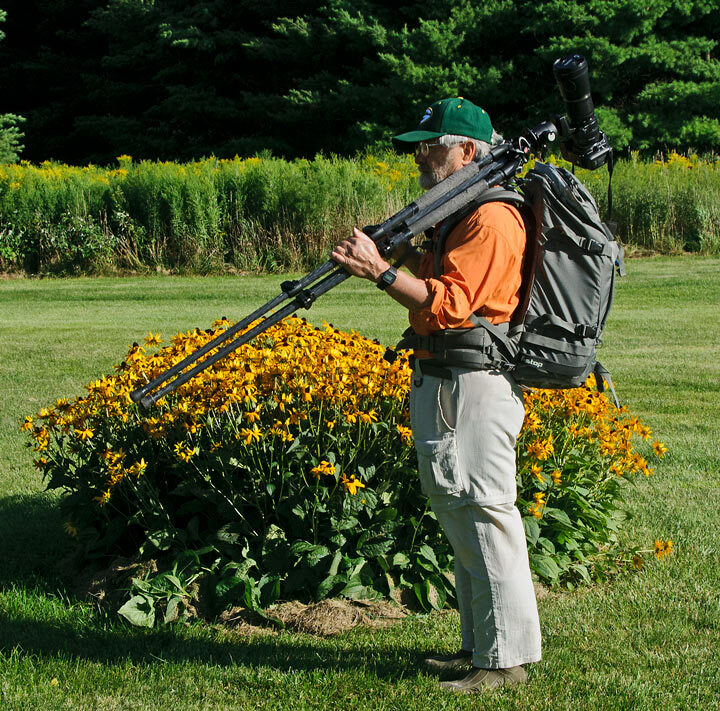 If I’m going to be hiking for some distance (10 miles) and I know I will be photographing a variety of subjects along the way I mount the camera on the tripod and carry it over my shoulder. Typically I use a two shoulder technique when hiking any distance. 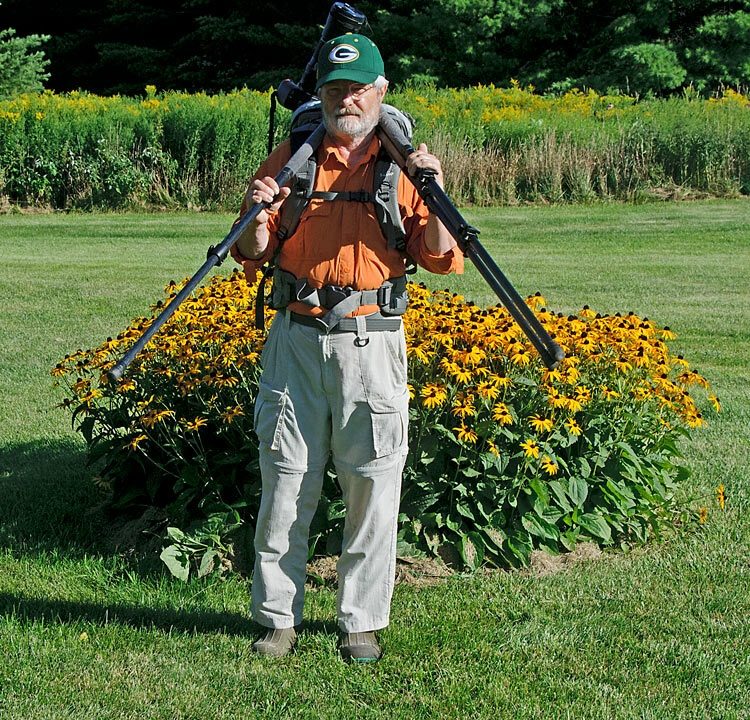 In this technique two of the legs are closed together and the third leg is opened allowing me to distribute the weight of the tripod, head and camera on both shoulders with the upper legs of the tripod resting on the backpack shoulder strap padding. This works well on a wide trail where the legs won’t be interfering with oncoming hikers or get caught in brush. If you are on a narrow trail I shorten the legs so they don’t stick out. This approach works well in the Midwest where the trails are normally through forests. Frequently on long hikes I’m photographing fauna along the trail so shortened legs with one leg opened is ideal for photographing close-up shots. If I will be hiking just a few miles and photographing along the way, I generally use the single shoulder technique. 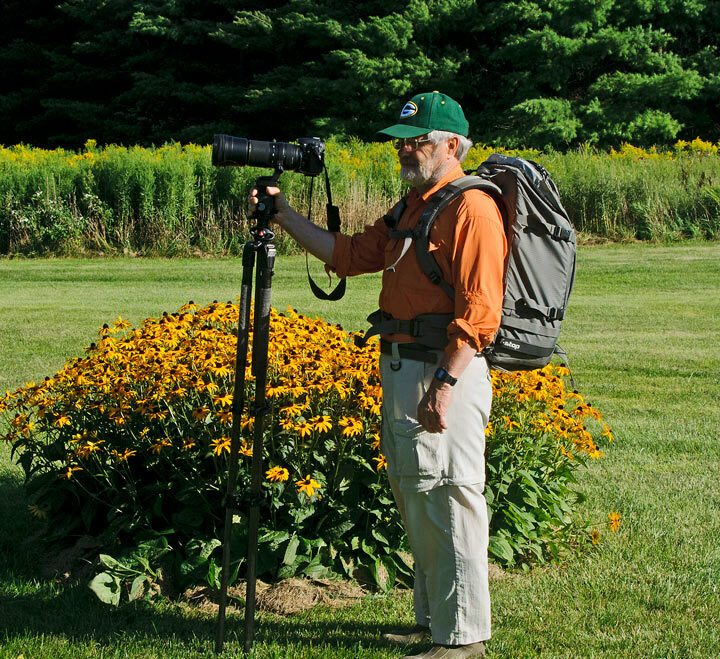 In this technique I close the tripod legs and carry the tripod and camera over one shoulder. If I’m just moving around a shooting location such as a waterfall I will carry the tripod and attached camera in my hand. The hand carry is the easiest and offers great flexibility when moving about. The tripod, even with the camera mounted, makes a nice walking stick for uneven ground and while wading in streams. It has saved me from falling on a number of occasions.